The importance of ‘unity’ or doktsa.chikdril is one of the most repeated messages from inside Tibet. Brave singers have extolled unity in numerous songs and courageous writers have written about it in poems, essays and books despite harassment, torture and imprisonment by the Chinese authorities. In exile, His Holiness the Dalai Lama and elected Tibetans leaders have continuously urged Tibetans on both sides of the Himalayas to remain united to sustain the struggle in the long run and achieve its goal. In fact, Prime Minister Lobsang Sangay declared ‘unity’ one of the three guiding principles of his administration. 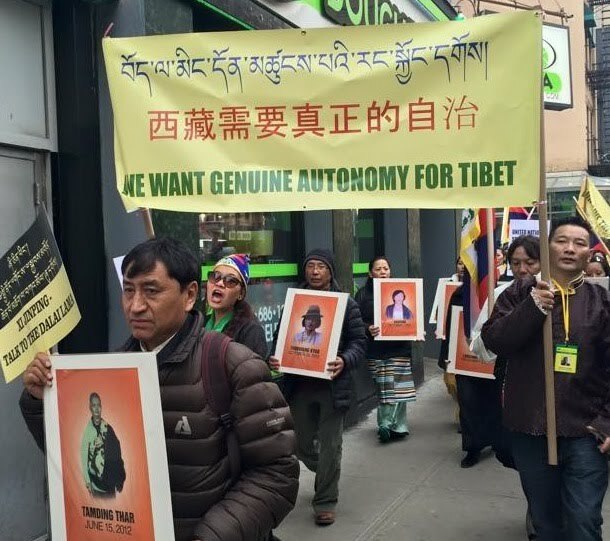 However, in a sad and disappointing development, divisiveness has overshadowed the March 10 commemorations of Tibetan National Uprising Day in Dharamsala, the Tibetan exile capital, and New York, the largest Tibetan community in North America. The questions are why, why now, and how to repair this rift. In Dharamsala, the seat of the Tibetan Government-in-Exile, the Tibetan Women’s Association (TWA) and Gu-Chu-Sum Movement of Tibet pulled out of the annual March 10 protest organizing group. The protest march takes place annually from the H. H. the Dalai Lama’s temple to Lower Dharamsala. Each year on March 10, after the official function and speeches, the protest march is traditionally led by the five major NGOs – the Tibetan Youth Congress (TYC), Students for a Free Tibet-India (SFT), National Democratic Party of Tibet (NDPT), Gu-Chu-Sum, and TWA. This year, during a meeting of the five NGOs to discuss the annual protest march logistics, TWA demanded to have a set of pre-decided slogans vetted by all the organizations, unlike before. Three NGOs (TYC, SFT, and NDPT) suggested that people should have the freedom to choose what slogans to chant and what to write on their placards. They further suggested that if slogans were to be pre-approved for the occasion, then the three important slogans should be: Independence for Tibet; China out of Tibet; and Long Live His Holiness the Dalai Lama. Tibetans chanted these three slogans on 10 March 1959 during the National Uprising. TWA apparently disagreed with this and walked out. 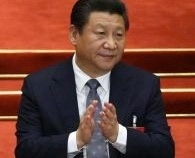 Gu-Chu-Sum also failed to agree to the suggestion and left. 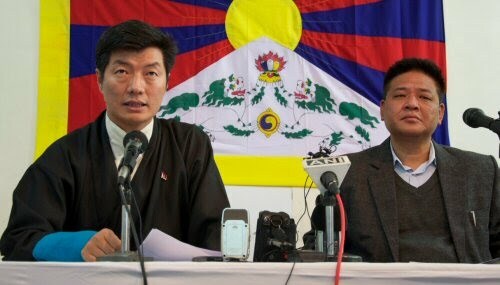 For background on the political stand of each association: TYC, SFT and NDPT stand for a free and independent Tibet as their aspiration to end China’s occupation of Tibet, whereas both TWA and Gu-Chu-Sum have chosen to support the official position of the Middle Way Approach to solve the vexed issue of Tibet. Every year until now, diverse slogans coexisted in freedom. What sparked TWA and Gu-Chu-Sum’s extreme position this year? What changed? In New York City, a similar issue of divisiveness and intolerance of free expression arose, also for the first time. 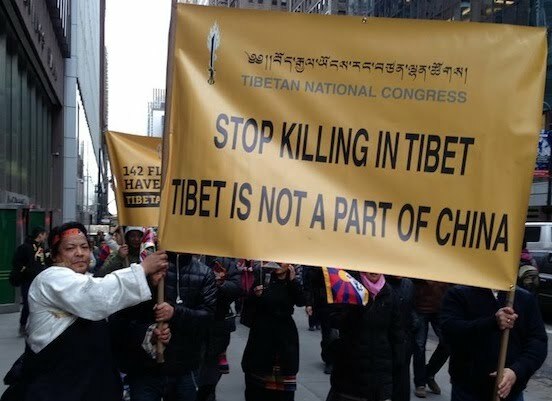 The March 10 protest in New York is traditionally organized by six groups: the Tibetan Community of NY/NJ (TCNYNJ), Students for a Free Tibet (SFT), US-Tibet Committee (USTC), Regional Tibetan Youth Congress (RTYC), Regional Tibetan Women’s Association (RTW), and Chushi Gangdruk. This year, TCNYNJ, RTWA, RTYC, and Chushi Gangdruk demanded control of the messaging and speakers of the March 10 event in NYC. These four groups would not permit any slogans like Free Tibet or Independence for Tibet. TCNYNJ even announced on its official Facebook page that other signs, signs brought by the people, were prohibited at the march. This note was soon taken down; the organizers seemed to have realized how draconian and ridiculous this would look. Since 1959 when the Tibetan people first spontaneously rose up against the occupying Chinese forces, the March 10 protests have been a protest organized by the people and for the people. Our Tibetan term for the protest, Mimang Gerlang (literally: private uprising by the people), emphasizes its spontaneous, individual and grass-roots nature. March 10 doesn’t belong to any particular group or organization; it belongs to the people. Ultimately, supporters of the Middle Way and supporters of Rangzen want the same thing: freedom for Tibetans inside Tibet and resolution of the Tibet issue. SFT and USTC did not object to anyone promoting or supporting the Middle Way, but they wanted space to voice their own views too. However, the other four groups opposed anyone calling for a free or independent Tibet (slogans that were perfectly acceptable in years past). Because these four groups would not allow SFT or USTC to have their own speakers or slogans, and would not allow them to use the slogans that Tibetans have raised since 1959, SFT and USTC withdrew from this year’s March 10 organizing committee. TPR editors have been informed that at the rally at the United Nations, the organizers (TCNYNJ, RTWA, RTYC, and Chushi Gangdruk) would not permit anyone or any group who supported independence (such as SFT, USTC, and Tibetan National Congress) to participate or even join the March 10 protest. 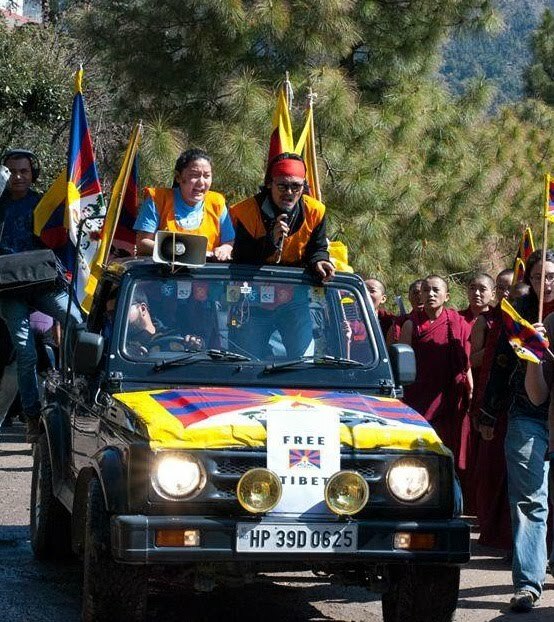 These groups participated anyway, as was their right as free citizens and loyal supporters of Tibet. 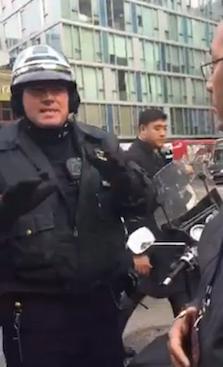 There is an appalling video circulating that appears to show a march organizer asking the New York Police Department (NYPD) to exclude these pro-independence groups from the event. It is a tribute to the NYPD that the police officer instead cited everyone’s First Amendment right to free speech. It is deeply shameful if a Tibetan member of the March 10 organizing committee needed this lecture from an American police officer. It is truly a sad day if a Tibetan tries to get the police to exclude a fellow Tibetan from the March 10 commemoration, simply because that Tibetan supports independence. The Chinese government must be gloating. The March 10 National Uprising Anniversary and its commemoration is the heritage and duty of every Tibetan. Almost every Tibetan in exile has memories of participating in this annual protest; perhaps perched on a parent’s shoulders, perhaps leading the chants with a bullhorn. No political association, individual, or governmental body has an exclusive claim on this historic day. March 10 belongs to the entire Tibetan people. The March 10th Anniversary is not a day to bring differences to the front and hamper our overall strength and unity in our community. It is a day to honour all those who sacrificed their lives for the cause, to remember them and reaffirm their place in our history and to renew our dedication to Tibet’s struggle for freedom. This is not a day to prove a point. 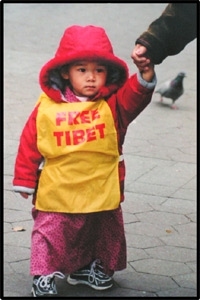 The actions of TWA and Gu Chu Sum in Dharamsala and TCNYNJ, RTWA, RTYC, and Chushi Gangdruk in New York, by refusing to compromise with anyone who disagreed with them and excluding anyone who had a different view, send the wrong message to Tibetans in exile, Tibetans in Tibet, and to Tibet supporters. Tibetans are united on many issues such as human rights, environment protection, freedom of speech and religion, cultural preservation, etc. We must not allow political differences about Middle Way or Rangzen to divide us; ultimately this hurts the Tibetan cause. It is not enough for the CTA to make passive statements, however, especially when the past couple years have seen increasing divisiveness in the Tibetan exile community. This divisiveness has coincided with the current CTA leadership aggressively promoting its new interpretation of the Middle Way, with tactics that (purposefully or not) have had a chilling effect on free speech, have marginalized pro-independence supporters as almost “anti-Dalai Lama”, and have sought to make acceptance of one particular policy the litmus test of political orthodoxy (e.g. see here, here and here). When we ask what has changed, when until now Tibetans of differing viewpoints could still commemorate March 10 united as Gangchenpas, we cannot help but wonder: what role has been played by the chilling effect created by the current CTA leadership’s campaign? But let us set aside the CTA leadership’s contribution to, and perhaps even responsibility for, the current dis-unity. The fact is, the CTA leadership now has an obligation to actually lead. Passivity should not be acceptable, and exacerbating the problem should be unthinkable. That means accepting responsibility, and taking concrete action to fix problems. 7. Commit not to misuse His Holiness’s name to advance a particular policy (a policy which does not even align with His Holiness’s well-known support for democracy). If the CTA were to show courage and leadership in actively taking steps to promote true unity, then that would be a major achievement to benefit all Tibetans. There can and should be differences in political aspiration and approaches in our struggle for freedom. To have different positions and standpoint is the very essence of democracy. Indeed, diversity of opinion and freedom of expression are cornerstones of a democratic system. However, varying political outlooks should in no way divide us on such important historic occasion as March 10. We must stand in unity. At a time when China is facing grave internal crises – ranging from aging population, environmental catastrophe, endemic corruption and economic slowdown – and at a time when some of the foremost China-watchers write about possible ‘Chinese crackup’, we should have our feet firmly on the pedal to increase the strength of our non-violent struggle and stand in unity with our sisters and brothers inside occupied Tibet.